I just discovered I missed the Purim party in my congregation; I was absolutely certain it was tomorrow… and was feeling overwhelmed by that and many other things, and asking the Lord to help me. I turned on Facebook, and up popped this “you have a memory” on Facebook. Displayed before me was a post I had written three years ago. The same Lord, same encouragement, just different circumstances. As I wrote then (and you can read it below), we are in this together. Do you feel like you are going in circles getting nowhere quickly? Are you tempted to give up? The enemy of our souls had pulled out all the stops because he is afraid of the work Jesus is doing in us! I hope you will be encouraged by my original post. It has been one of those weeks where it seems like each step forward was accompanied by three steps backward… not a gentle dance mind you. The backward kind of steps where you feel like someone has grabbed you by the neck and thrown you back, in the hopes that the three steps backward will turn into a breaking blow. You get up, brush off the dust only to receive yet another crushing blow. For me, when the stress levels get high, all my coping/escape mechanisms come out in full force. I want to do anything but deal with the issue at hand. But putting it off, or not paying attention can be costly. In my case, it only cost me a few hundred dollars—but the cost could have been much greater. A careless wrong turn can cost a lot more than money—it can cost in our relationships, our health, our walk with God, and in some cases, even impact our health and lives. Life happens, and for some reason, we begin to not take care of ourselves. I’m talking about a lot bigger picture than eating right, exercising, or getting enough rest. I can do all that and still not take care of myself. How? By refusing to accept myself as He accepts me. By refusing to be merciful to myself as HE is merciful to me. And yet, if I cannot accept His acceptance and mercy and love for me, and treat myself as He treats me—how do I think I can give that love and acceptance to others? 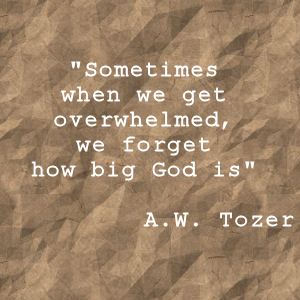 And what does that have to do with feeling so overwhelmed? When all these things start going wrong, I seem to hear the voices of condemnation so easily. This happened because you didn’t give the money to someone, so God took it another way. This happened because you wasted so much time, so God is making you waste more time. When we are stressed, overtired, and feeling bruised and beaten, and are very aware of what we really did do wrong, the accuser sounds so logical, so right. And that is the problem. Sometimes the accusations are true. In my case? Yes, I wasted time. Yes, I let myself get distracted from a gift I meant and wanted to give. But I also confessed these things to my wonderful Savior and have asked His help to find victory. Condemnation does NOT come from our loving Father—conviction does. Being pushed down does NOT come from our loving Father—discipline does. When the evil one accuses us, Jesus is standing there interceding for us—our blessed advocate pointing out the robes of righteousness that we are clothed in. If HE is not going to punish us, hate us, and give up on us—who are we to give up on ourselves? This has been a very real struggle for me lately. I can’t help but think I am not the only one who struggles with this. We don’t’ talk about it, but the struggle is there. As I’ve been writing, several verses came to my mind. I pray that these verses will encourage you as they do me. We are in this together, and someday, the feeling of being overwhelmed by this life will pass, and we will know the wonder of being overwhelmed by HIS love as we bask in His presence with joy. Oh what a day that will be! “What a wretched man I am! Who will rescue me from this dying body? I thank God through Jesus Christ our Lord! So then, with my mind I myself am a slave to the law of God, but with my flesh, to the law of sin. “Who can bring an accusation against God’s elect? It seems for me anyway, I may have a two week long peaceful time, but never longer. Never! It’s like God is giving me a peaceful time and to be ready, prayed up, for what will come. I”m 62 and have lived with huge losses. I know what I’m talking about. And, God is always Good. Thank you for this post, Deb. Jeanne, I’m so glad I could encourage you. May we both walk in the freedom God wants us to have and rest in His love. Dvora, you hit the nail on this one…and over my head. I took a walk this afternoon and tears threatened as I felt that overwhelming feeling. And you are right, we do (I do too) run away to avoid whatever it is that’s dogging us. The voice of condemnation shouts louder than my shoes hitting the pavement. And, on and on it goes. Thanks for your words that shouted over the taunts of the enemy today.